Christopher M. Kittell is a founding shareholder of Albright Kittell PC and has been practicing law in Tillamook County for over 35 years. Chris’ intelligence, pragmatism, and empathy shine brightly in his primary practice areas of estate planning, wills and trusts, real estate, and business formation, management, and administration. A particularly unique aspect of Chris’ law practice is his emphasis on family business relationships, and his ability to use the law to promote the benefits of such relationships while protecting against the risks. Chris also represents a number of water and sewer districts. Chris is active in the community and has served on the Tillamook Chamber of Commerce Board of Directors, is a past President of both the Tillamook Kiwanis Club and the Tillamook County Bar Association, and is active as a Lector at Sacred Heart Parish. 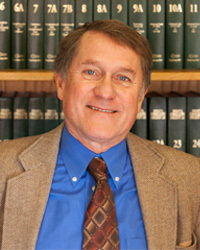 In the past, Chris worked for Oregon Representative Edith Green, was a former Director of the Environmental Studies Program at Lewis & Clark College, served as past Chairman of the local Oregon State Bar Ethics Committee, and served for several years on the Oregon Salmon Advisory Committee. Both Chris and his wife (and law partner) Lois Albright were commercial salmon fisherman based in Pacific City before becoming full-time attorneys. When not in the office, Chris tends to his productive garden, takes walks with his three dogs, travels the world, and helps in community projects.